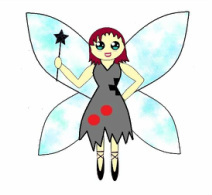 The place where you will find out about Retro Faerie. Basically I am a crafter, I love making and designing things from jewellery to clothing. I also share some of my idea's and techniques through my FREE tutorials. Feel free to look around the site, all feedback is welcome I'd love to hear from you. Also if there's any products you would like to see in my tutorials just get in touch and I will see what can be done! Some of my jewellery was featured in the Make Jewellery Magazine June 2010 edition. 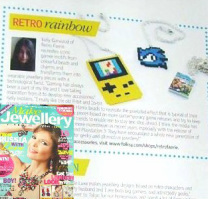 It was a feature on geeky and gamer jewellery and as you can see it shows my Hama Bead Gameboy Colour/Sonic necklaces and Mario Party 8 bracelet. The Gameboy Colour also featured in the NGamer Magazine (Nintendo Gamer) in the same year, it's one of the most popular Hama Bead items along with my Zelda Heart-O-Meter bracelet.